In anticipation of the release of his fourth studio album Criminal - out 2 February via Sacred Bones - Berlin via Oakland artist The Soft Moon, aka Luis Vasquez, today shares heavy new industrial single Choke, which premiered today via Revolver. The Soft Moon's fourth studio album, Criminal, is a confessional work. Through the stark lens of shame and guilt that has followed Luis Vasquez since a violent childhood growing up within the humming ambient sprawl of 80s Mojave Desert, here he documents the gut-wrenching sound of going to war with himself. Battling with his own sanity, self-hatred, insecurity, self-entitlement and grappling with the risk of these things transforming him into a person he despises, Vasquez has laid his feelings bare with this: his confession and most self-reflective work to date. Criminal marks a striking and important chapter in his self-exploration, both artistically and emotionally. Working once more with Maurizio Baggio, who produced Deeper, at La Distilleria in Bassano Del Grappa, Italy, Criminal sees Vasquez further explore putting his lyrics at the forefront. Soft Moon is playing a live show with support from Sarin in The Dome in London on 16 February. 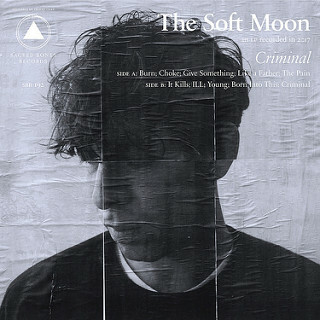 Soft Moon's fourth studio album Criminal is out 2 February via Sacred Bones.